I love Stationery, it is my greatest weakness, there’s just something about hunting and gathering for Stationery items (most likely the illusion of productivity) that is both enjoyable and calming for me. The problem with Stationery is that once all the required items are assembled, that means I have to begin the desired project, which can be problem when you’ve perfected the art of obtaining items for said project but usually fail when it comes to actually completing the project. For example: I really wanted to get into Book Binding or Book Making, I love blank notebooks and it would be awesome if I could just make my own blank notebooks. But then I found out you actually need to be talented at sewing to make books, and I am truly awful at sewing, so all of my book-binding equipment has been sitting in a canvas shopping-bag inside my Room of Laundry for several months, dusty and forgotten, until I start riffling through my bookshelf (where my guide to making handmade books is) and I wonder what happened to my Book Making equipment. But, this time, I’m fairly certain I’ve found a hobby that is both Crafty, doesn’t rely on Sewing to complete and is possible for me to obtain all the required tools and items. I am talking about Beaded Jewellery, specifically Bead Ring Necklaces. Kim has set up a new WordPress-blog called Abstruse Arcana: Neurodivergent Arts and Crafts and the first post is a tutorial on how to make Bead Ring Necklaces, which I’m hand-flappy excited about it as I’ve been wanting to make Bead Ring Necklaces for ages now. So, this post will be going through the items I purchased in order to make Bead Ring Necklaces, where I bought them and how much they cost (and maybe some random items thrown in for good measure). 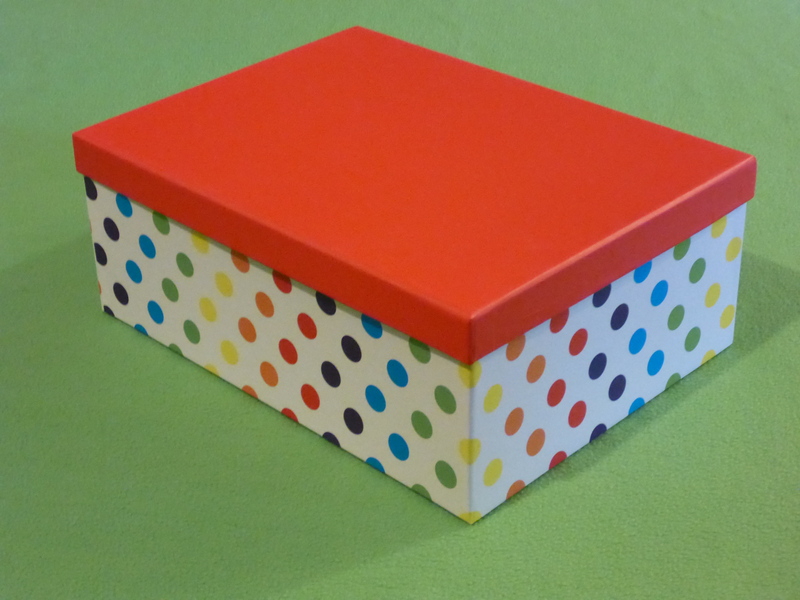 I’ll be using this box to store all of my bead-related items inside of, isn’t adorable? I just love polka-dots but especially rainbow polka-dots. These aren’t the doughnut-shaped pony beads but rather they are shaped more like an hour-glass (I think, I’m not entirely sure, I could be wrong). Kim uses these beads on my Pink Drawstring Dice-bag they made for me. 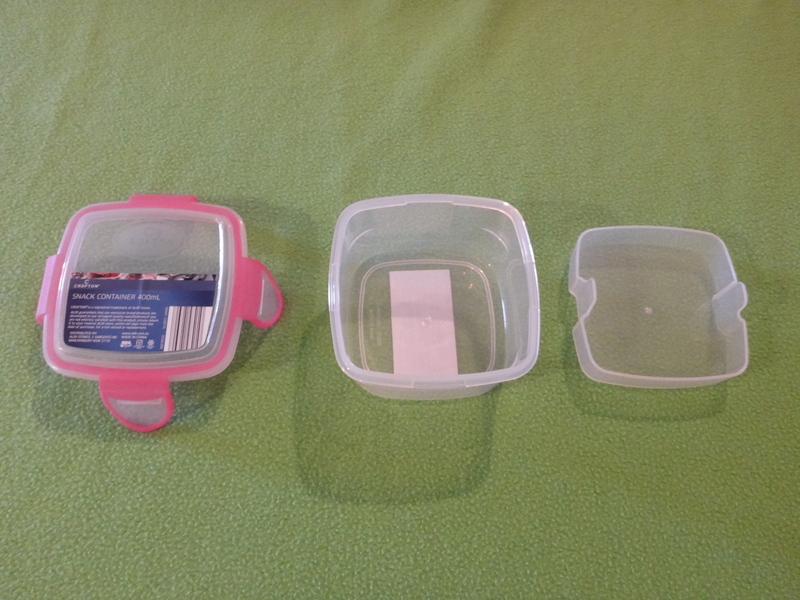 Image Description: Hoopla Sweets Collection pink plastic lunch-box with snap-on lid. 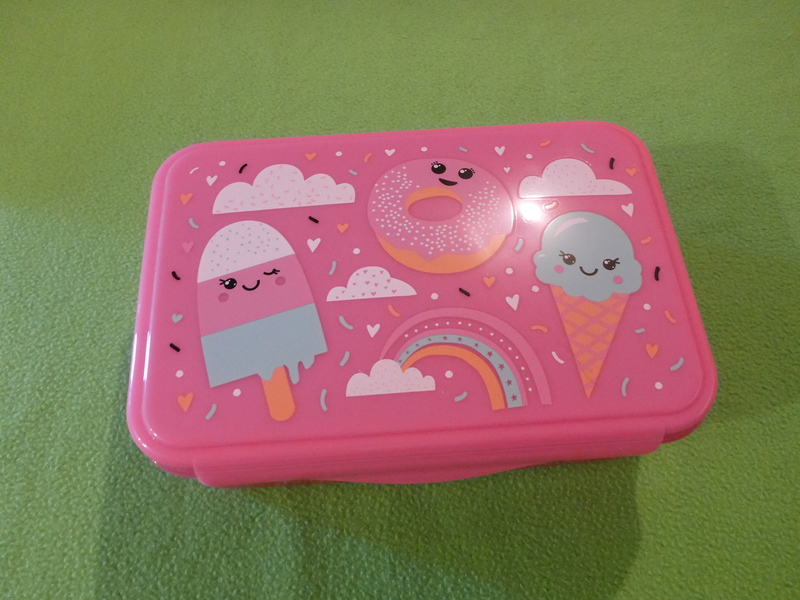 The lunch-box has clip-art pictures of an ice-cream-on-a-stick with a smiley face, a doughnut-with-pink-icing also with a smiley face and an ice-cream-cone with blue-gelato and a smiley face. There are also clouds and a rainbow. 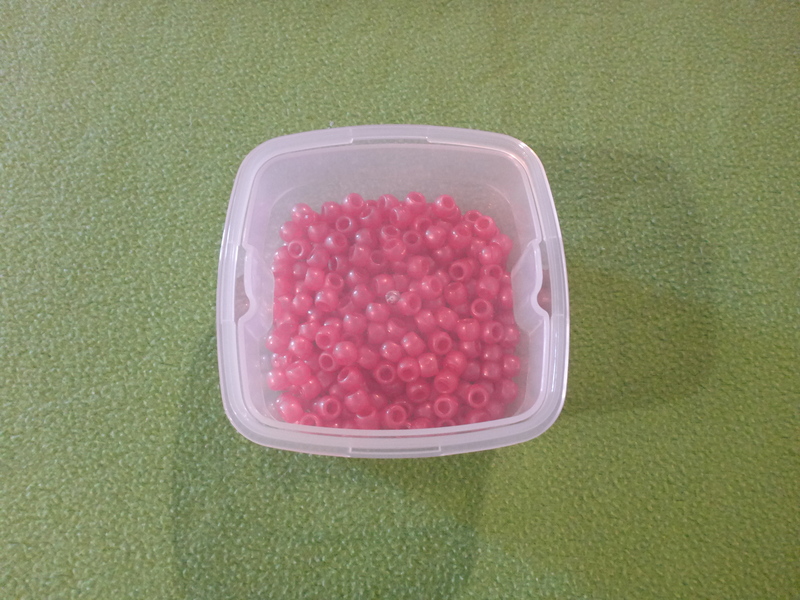 Image Description: a pink plastic lunch-box containing a 1 LB (435.59 gm) bag of Pearlized Pony Beads in mixed colours. While I like transparent Pony Beads and glittery Pony Beads, if I had to pick just one type, it would be the pearlized Pony Beads, I am a sucker for shinny objects. 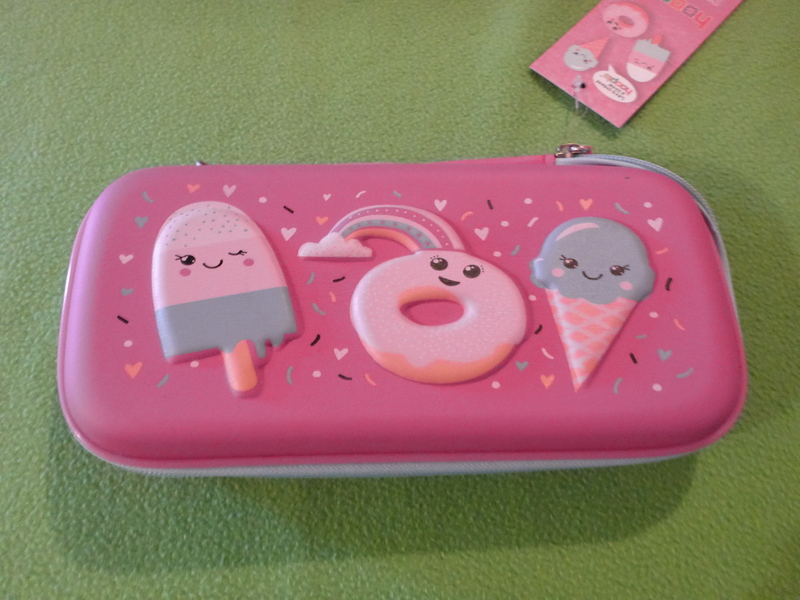 Image Description: The insides of the Hoopla Sweets Collection pencil-case. 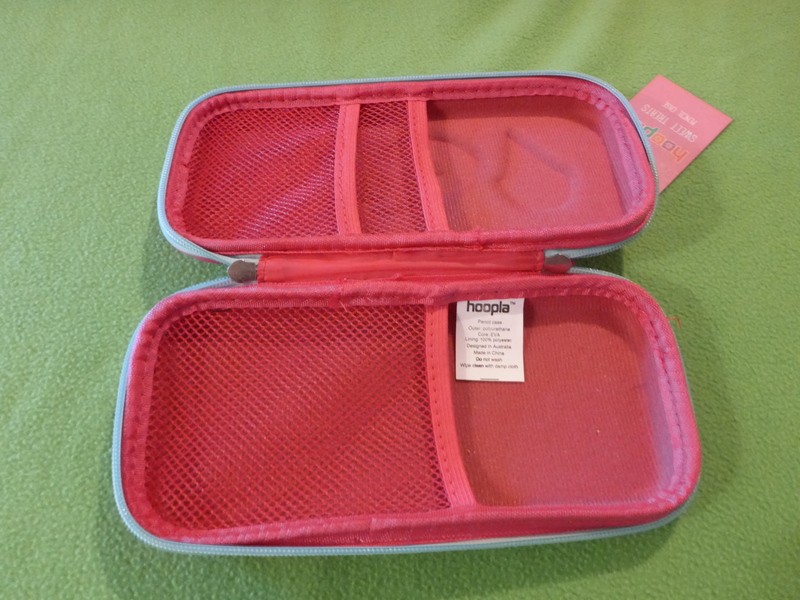 It’s pink with a couple of sections of netting to separate the two halves of the pencil-case. I have about three of these snack containers (one from K-Mart and the other two from Aldi) and I thought I could use them for specialised beads, such as some star-beads I bought from Lincraft but also some glittery star-beads I bought off of Ebay. I thought I could use them for the ends of Bead Lanyards, however, I should probably figure out how to make Bead Ring Necklaces first (it goes cart THEN horse, I need to remember that). 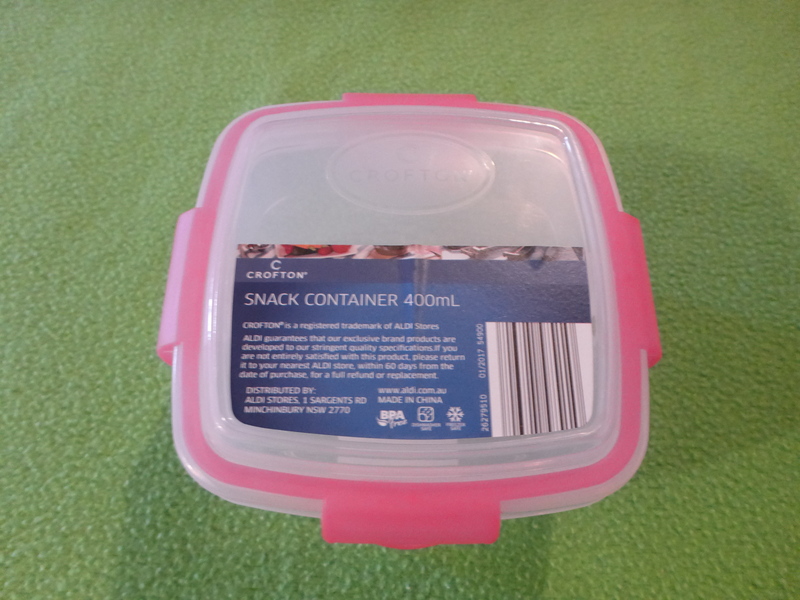 Now this is one of the snack containers I bought from Aldi. 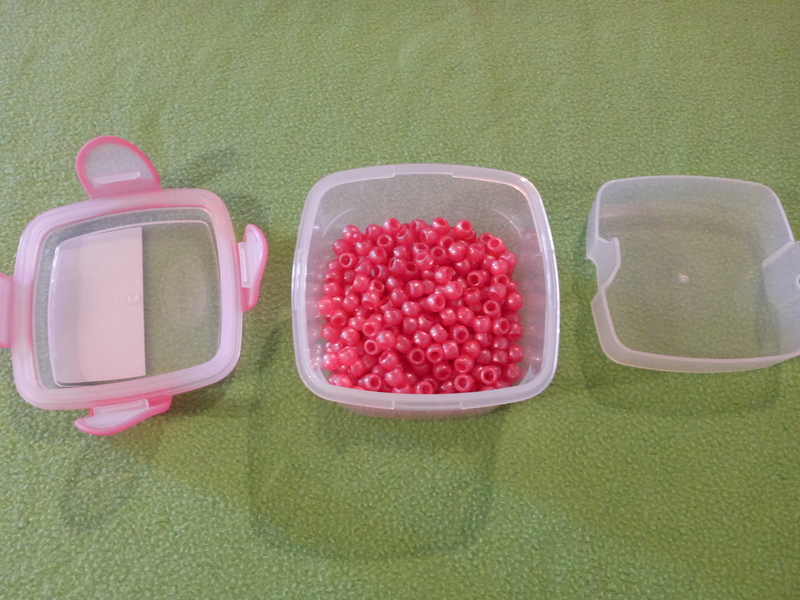 I’ve placed the pink pearlized Pony Beads in the container to demonstrate size and scale of the containers. 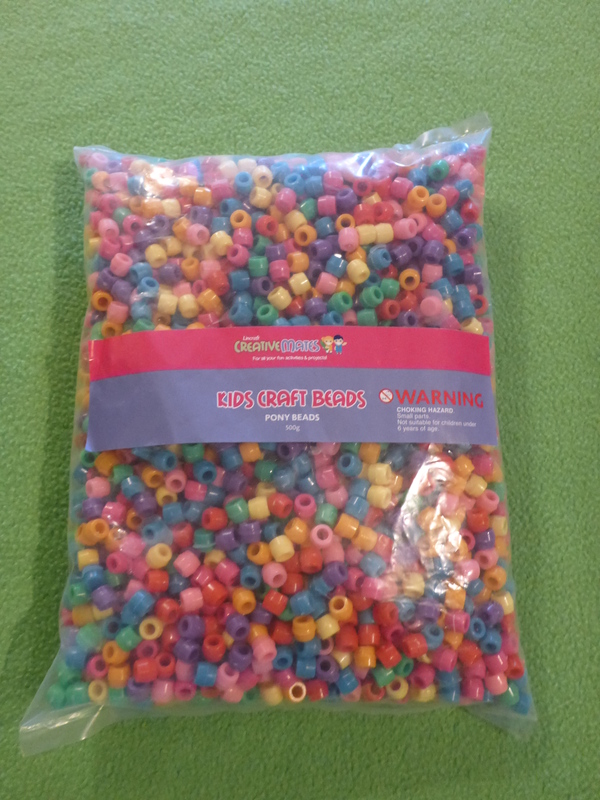 They look small and I was almost afraid they would be too small to store Pony Beads in, but they surprised me. 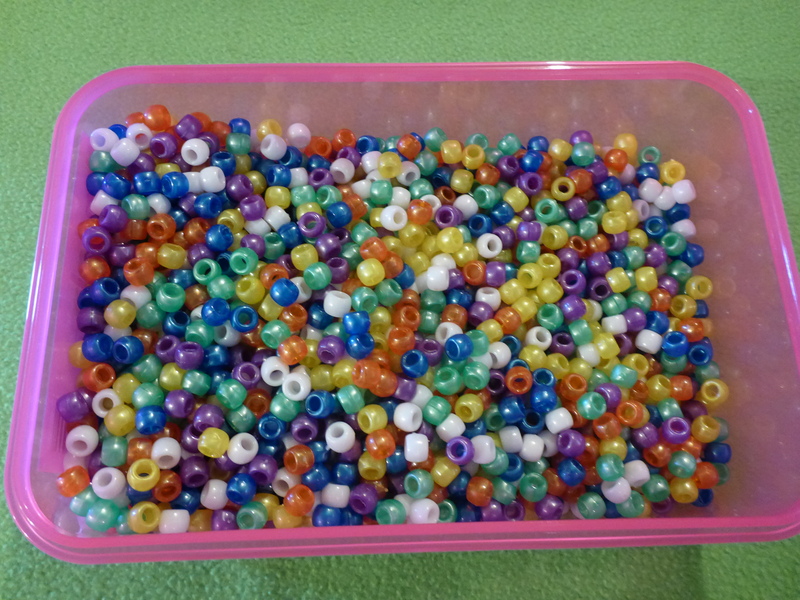 If desired, you can fit two colours from a large mix-colour bag of Pony Beads. I thought I might be able to use these to make Beaded Lanyards but I think these might be too thin, not sure, I’ll have to find out. 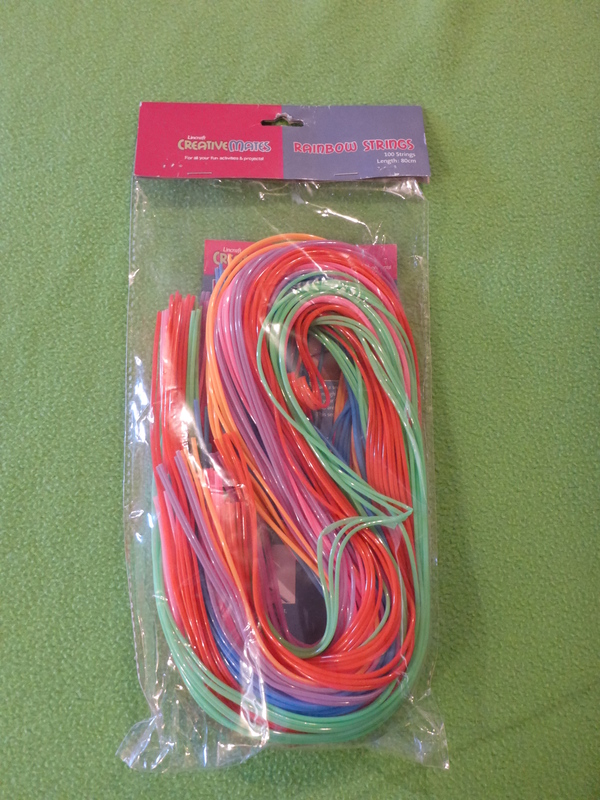 Image Description: there are two items in the photo, from left to right, the first item is a packet of Hair Elastics in pink, yellow, white and blue. 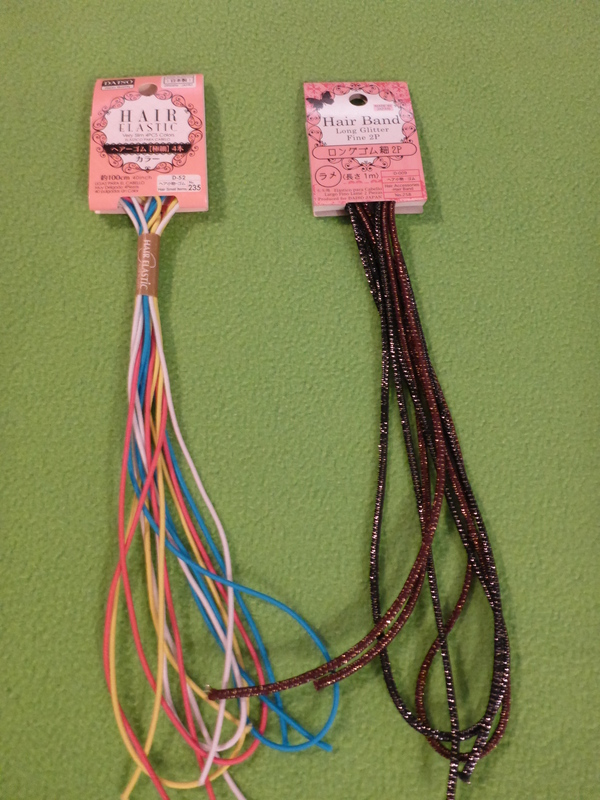 The second item is a packet of hair bands in brown hair-bands with silver-sparkles mixed in and black hair-bands with silver-sparkles mixed in. I also bought these with the intention of using them to make Bead Lanyards, however, I think these might be a little too thick. I won’t know for certain until I attempt it, I shall keep readers posted on my progress. 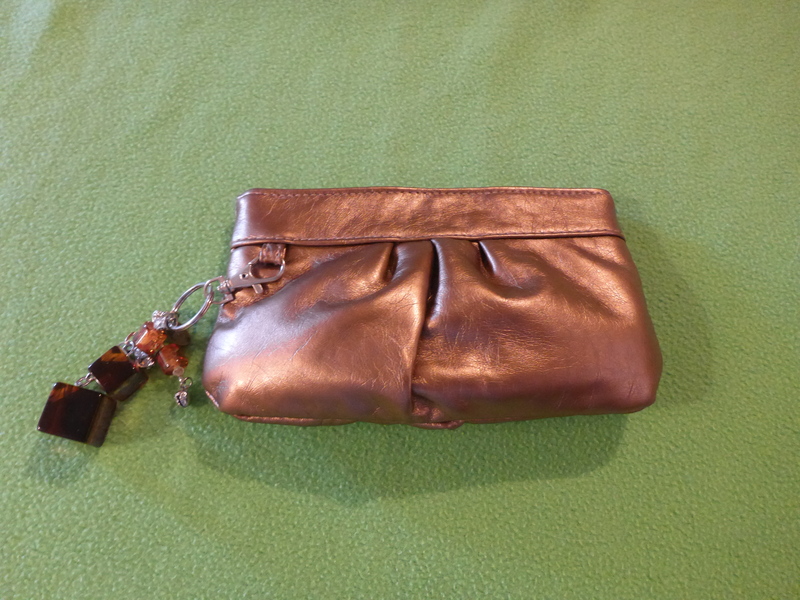 Image Description: A small bronze-coloured clutch-purse with various brown key-ring accessories attached to it. This was given to me as a Christmas/Birthday gift ages ago, I don’t use it at all, however, I have re-purposed it to hold jewellery I no longer want to use such as a bracelet with dolphins on it (how do people get the impression that I like dolphins? I’m not saying they’re bad, I just don’t have any interest in them). I thought I might be able to use them as stoppers on lanyards or general decoration for Bead Ring Necklaces. 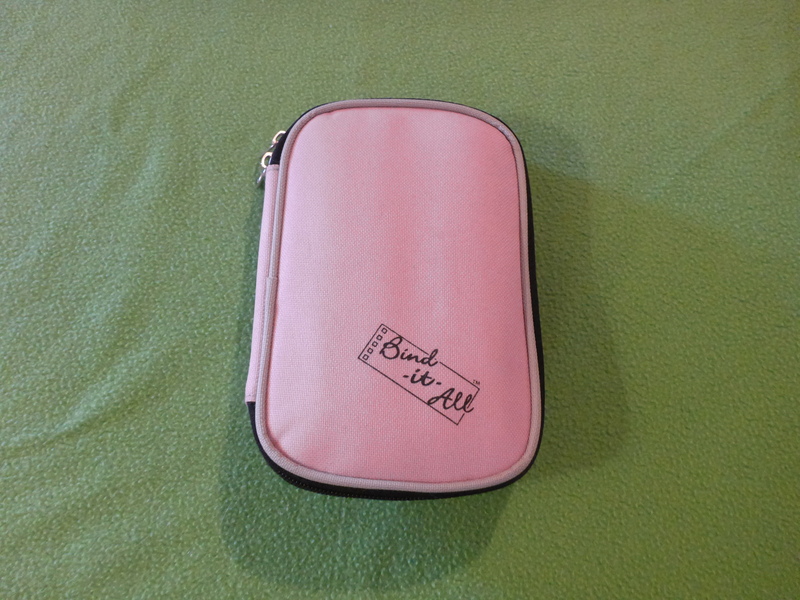 Image Description: Zutter Bind-It-All Book Making Kit in pink. Image Description: Inside of the Zutter Bind-It-All Book Making Kit. From left to right, a crafting-scalpel, a 30 cm metal ruler with cork on the back of it, a thick white object and it’s about as long as the metal ruler (I think the kit said it was flattening pages, I’m not entirely sure), then there’s a mental cylindrical object that looks like a pen but when you open it there’s a sharp metal pokey-bit at the end (I think it’s a scribe for indenting), then there’s a clickey black-ink pen, a small pink measuring tape, and spare scalpel-blades in a little plastic box. Image Description: Inside of the Zutter Bind-It-All Book Making Kit. 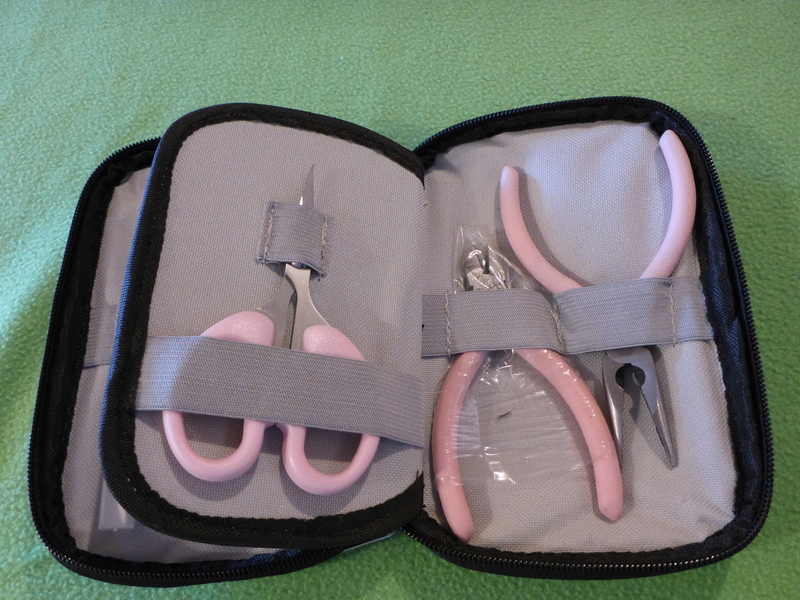 There’s a small pair of pink-handled scissors, a small pair of pink-handled pliers and a small pair of pink-handled needle-nose pliers. Amount: I dunno, I’ve completely forgotten. I bought this off Amazon ages ago (or at least four years ago), however, unfortunately Amazon no longer sells it. The closest I could find that also does international shipping is the Zutter Bag-A-Bind Tote, for some unexplainable reason most of the Book Binding/Book Making equipment that Zutter sells via Amazon is all pink. 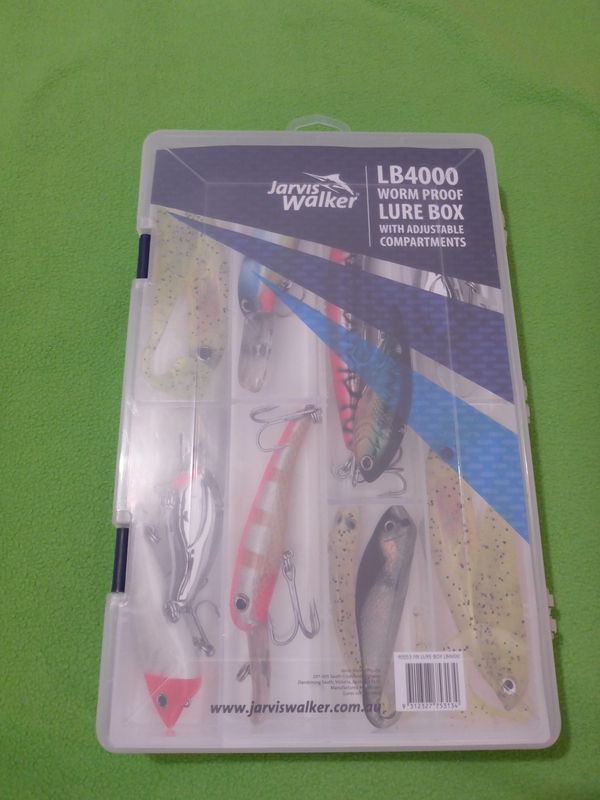 Image Description: a Jarvis Walker worm-proof lure-box with adjustable compartments. It also has pictures of various lures on the front of it. Image Description: the back of a Jarvis Walker worm-proof lure-box with adjustable compartments. I took this photo so readers could see the size of the compartments. There’s four compartments down and six compartments across. Kim recommended this purchase and where to find it (thank you) and I’m sort of annoyed with myself because I have the sinking suspicion I should have bought two, however, one should be enough for now. I plan on going down by type (for example: transparent beads, glittery beads, pearlized beads and hour-glass beads), then across by colour (for example: red, orange, yellow, green, light blue, dark blue, purple and pink). 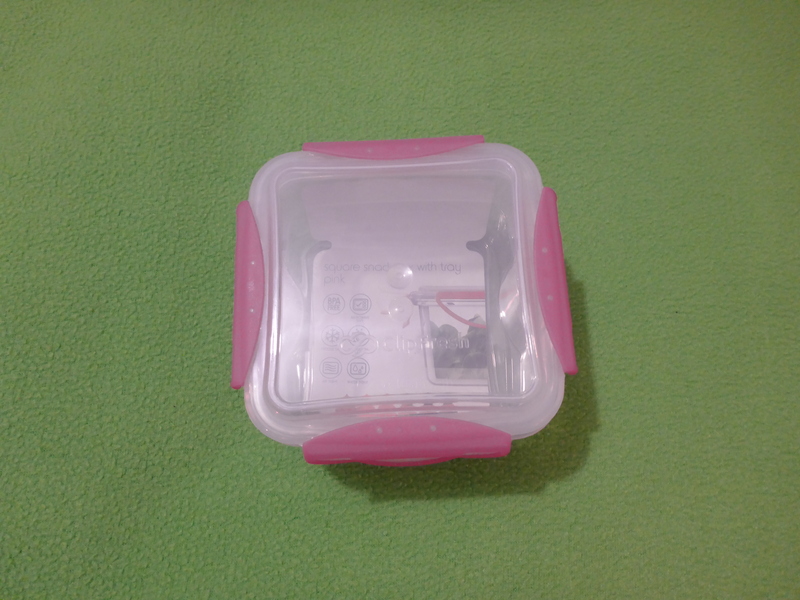 Although it only has six compartments across so I may need to place pink and purple beads in the snack containers for the time being. I’ll figure it out eventually. I know that my Bind-it-all kit looks like it has a pair of needle-nose piers attached to it, but I figured I’d get an extra pair just in case they’re too small to use. Unfortunately, I have yet to be able to find Key-rings/Split-rings (you know, the key component to the entire thing) despite traveling to various arts and crafts stores, but I shall not give up, not when I’m this close. I’ll keep readers posted on my progress. Maybe because I come from a family of crafters and have been crafting all my life and hence cadging craft materials from relatives but the idea of buying so much before you’ve even tried to make it amuses me. I bought one tiny pack of pony beads and a couple of split rings to start, nothing more. I hope you do genuinely like doing it! You may want even thinner needlenose pliers (specifically jewellery or beading needlenose pliers) if you have to use them to wedge the split rings open to thread the beads on. If you have hand strength to hold the ring apart, it might not be so much an issue (but it *will* hurt your fingertips) but *large* pliers are a problem here, not small ones. The smaller, honestly, the better. I’m a little appalled that you paid $10 for a divider box. I’ve never paid more than $6 or so for them. Maybe check out dollar shops? You don’t have to pay that much money for them. I’m pretty sure I’ve never paid that much for any I’ve bought from K-Mart, either – although mine didn’t have the adjustable compartments. 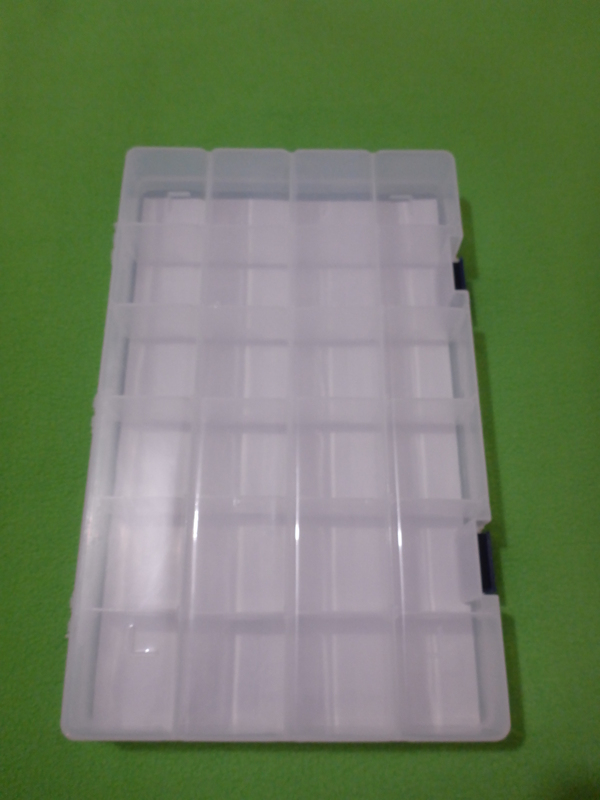 I’ve bought the adjustable compartment ones (sized large enough to hold sewing thread across each compartment – they’re fabulous) for $6 at dollar shops! What are you planning to do for the necklace chains? There’s several different sizes /shapes of pony beads; there’s no such thing as a consistent size or shape. Several of the “hourglass” ones I’ve got are still several different shapes whilst being approximately the same size. Same applies for the “doughnut” ones. Yeah, I tend to get little over-excited and a little over-enthusiastic about the “purchasing of items” aspect for a crafting project. My mother and sister are good with sewing and they both know how to crochet but I’m kinda awful when it comes to sewing and crafting things. 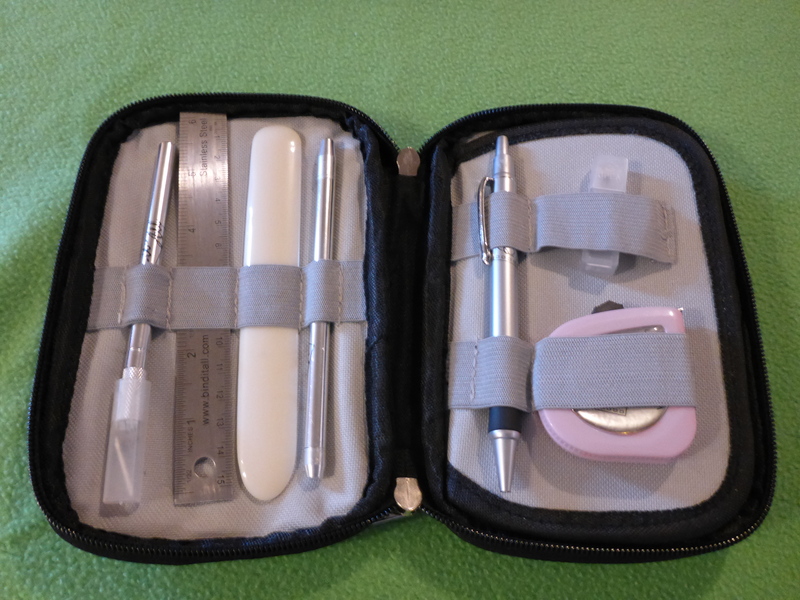 So while I am missing an awl for my book making collection, I have a small sewing kit I managed to keep from Secondary College that contains the basics. I unfortunately have a bad history of getting really interested (almost to the point of obsession) in a topic and then I either get distracted, or bored (or both) and I end up dropping it completely, but I have a good feeling about this. Besides, I figured if I don’t like it or I get bored with it, I can offer my beading stuff to you, although you are of course under no obligation to accept. The Girdle Book looks awesome and fascinating, I have a book on how to make Homemade Books, so I’ll bring it with me when we catch up next so you can check it out (maybe there’s something in there that can help). 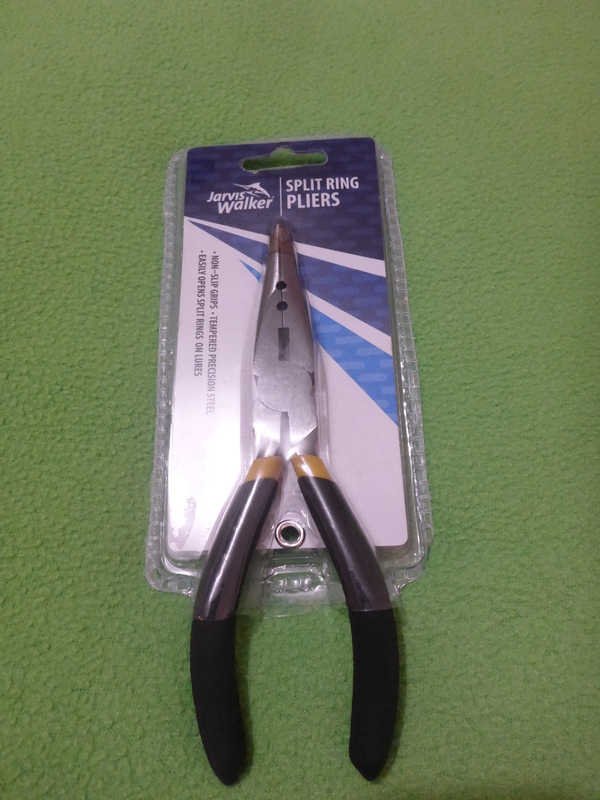 Thanks for the heads up on the needle-nose pliers, in fact, Brendon recommended we check out Bunnings Warehouse to see if they had a divider box and the right kind of pliers, unfortunately Brendon doesn’t normally get home until about roughly 7:00 pm so it does limit my choices of shops open. I have been hunting around in a few dollar stores I’ve been able to access, but every dollar store I’ve been to over the last couple weeks don’t have the required items (although I will acknowledge I’ve been limited to the Bendigo, Ballarat, Bacchus Marsh area and the Woodgrove Shopping Centre). K-Mart in Melton was the only place thus far I could find a divider box, but maybe I’m just not looking in the right places, I don’t know. I was planning on using rat-tail cord for the necklace chain but I’ve been unable to obtain it. Every Lincraft and Riot Arts & Craft store I went to gave me the WTF look when I asked about it and told me they don’t sell it (they gave me the same WTF look when I asked if they had Key-rings or Split-Rings). 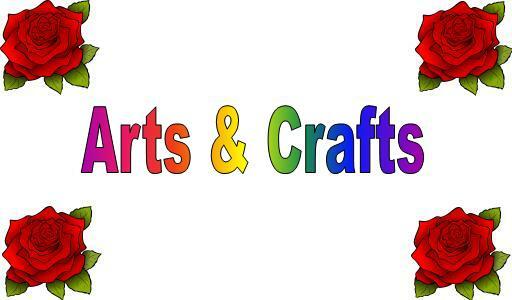 I even tried searching for rat-tail cord on the Lincraft and Riot Arts and Craft store websites and I still couldn’t find any. I managed to find some on Ebay but it’s 2mm by 200 yards and I figured that might be a little excessive. I’ll see if I can plan a road trip to the Ballarat Lincraft store (I’ve only been the to the Ballarat Riot Art & Crafts store). I did manage to find some key-ring/split rings on the website but they were too small, the only thing I could find on the website that resembled 30 mm key-rings were album loops. Maybe I’m just doing it wrong.